We’ve had some lovely clear autumn days lately, but yesterday was a wet one and the weather forecast suggests there will be more to come next week. In fine weather, we expect to be out anything from an hour to all day. When it’s wet though, I prefer to keep it short and sweet. 15 minutes to half-an-hour is the perfect amount for a 13 month old to have fun without over-doing it. For parents as well as toddlers. Waterproof trousers, jackets and rain footies are a must. Don’t over do it though, rainy weather doesn’t necessarily mean cold weather and waterproofs are a trap for sweat. Keep under-layers light (as appropriate) to allow for running around. Little people are especially vulnerable to changes in temperature and it can be dangerous for their core temperature to drop too low. 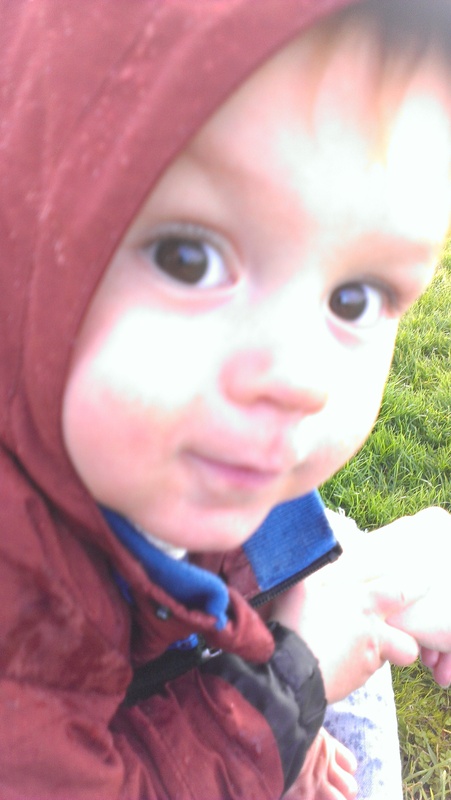 To avoid too long in chilly wet clothing once playtime is over, have a spare set to hand in the change bag, buggy or car. Getting outdoors should be fun, not a task. Head out with a positive attitude, even on the wettest of days, and you’ll be amazed by how much fun you can have. 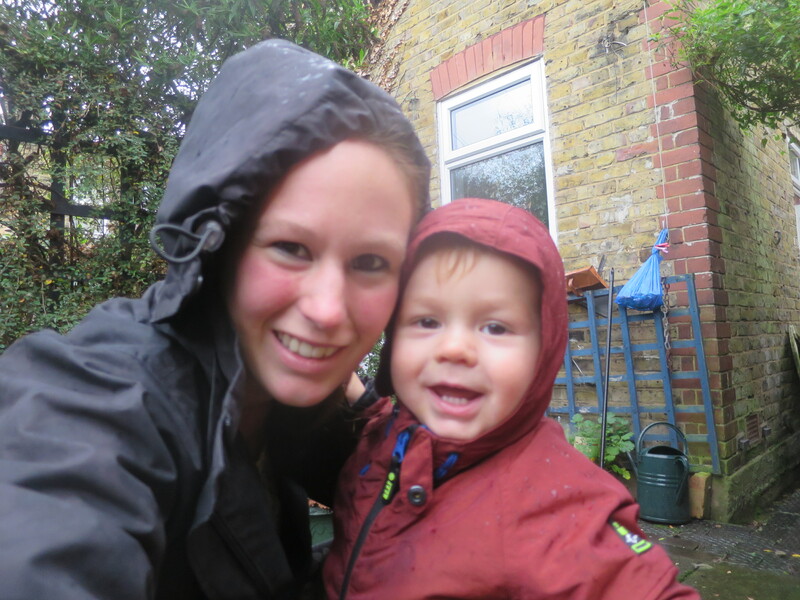 Splashing in puddles, catching rain drops and making mud pies. Just be ready for a nice warm bath to clean up once you get home. 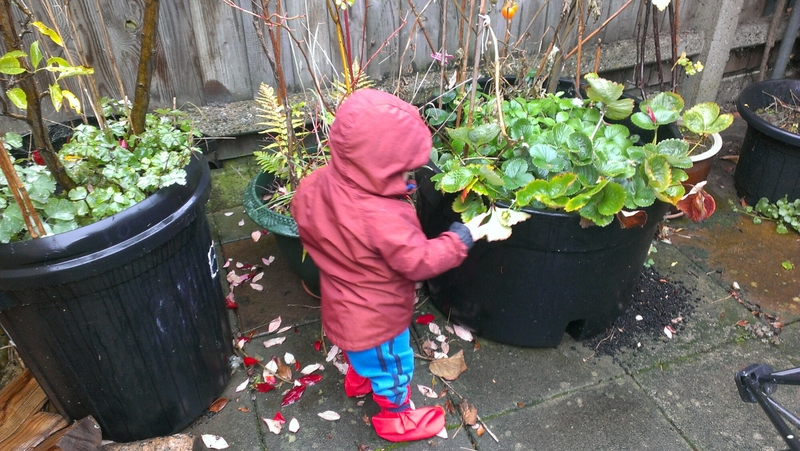 Posted on October 31, 2015 December 18, 2015 by LucyPosted in Outdoors, Play IdeasTagged Playing in the rain, rainy days, toddler, Wild Time. Us too. Though I’m going to need better mittens for Tom. Any suggestions? Google sock-ons for the socks. Sadly no other helpful suggestions! I've taken a pledge to make outdoor play a daily part of my son's childhood. 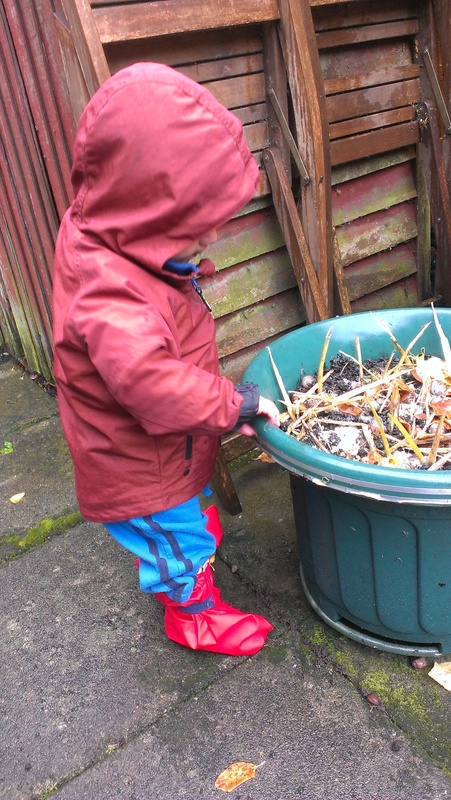 Follow along for adventures in the great outdoors, musings on natural childhood, info on green spaces in East London, and ideas for nature play.